I need to do a post on Here Be Magic tomorrow, so I’d like to do a roundup of random interesting worldbuilding trivia about the setting of Valor of the Healer and Vengeance of the Hunter! So if you’ve read either or both of the books, and you have questions about any aspect of the world, drop me a comment and I’ll include it in the post that’ll go up tomorrow on the Here Be Magic blog! I have been asked by a coworker of mine (who also happens to be a writer!) if I have a map available of Adalonia, the country where Valor of the Healer and Vengeance of the Hunter are set. Short form answer: no. The only map of the country exists in my brain. I’d draw one, except I’m not that much of an artist! However, I’ll talk a bit about the various important places in the setting, and my mental spatial sense of where everything is. Adalonia: The main setting of the story. In general it’s situated in my brain on a very large peninsula of the continent it’s on, somewhat roughly analogous to the Iberian Peninsula in Europe. Nirrivy: A currently non-existent country that was swallowed up by Adalonia a couple hundred years before the story. The territory formerly occupied by Nirrivy is now Adalonia’s western provinces. Kilmerry Province: The largest of the western provinces that formerly made up Nirrivy. Kilmerry is where most of the action in the story takes place, although I’ll be moving a lot of the action eastward in Victory of the Hawk. Shalridan: The capital city of Kilmerry Province and the former capital of Nirrivy. It’s on Kilmerry’s western coast and has open access to the ocean. Camden: Smaller than Shalridan, but still large enough to be fairly important, Camden is where the Duke of Shalridan’s family have their primary residence. It’s 2-3 days ride roughly east of Shalridan, depending on how fast you’re moving. Bremany: The estate of Kestar Vaarsen’s family and its attendant village. About a day and a half to two days’ ride roughly northeast-ish of Camden. Arlitham: A small village east of Bremany, close to the eastern border of Kilmerry Province. Dolmerrath: The last stronghold of the elves anywhere in Adalonia, situated pretty much as far northwest in Kilmerry Province as you can get before you hit water. Roughly three days’ ride north of Shalridan, two if you’re pushing it, and you can get up there faster if you go by boat. Tantiulo: The other major country mentioned in the story, from which several of the characters in the cast hail. Tantiulo is on a continent south of the one that contains Adalonia and is only reachable by ocean voyage, there’s no overland route between the two countries. Relations between the two have been strained ever since the war that took place roughly twenty years before the start of Valor of the Healer. 1) Elisiya, the long-lost homeland of the elves, was destroyed by Adalonia. Its territory is currently considered an Adalonian colony. 2) Vreyland, another country that exists in this world and which is passingly mentioned in Vengeance of the Hunter, will eventually be showing up in another book I have in progress, currently called Mirror’s Gate. Vreyland is a considerable distance to the northeast from Adalonia, and has a colder and harsher climate. When Adalonia wiped out Elisiya, quite a few of the elves fled in that direction rather than fleeing west, and Vreyland now has a considerable elven population. I will be referencing this in Victory of the Hawk. 3) The world in general, at least in Adalonic, is called Khilann. There are other names for it in Tantiu, Elvish, and the other languages in play in the setting, but Khilann is how I think of it. If anybody ever wants to draw me a map of the world of Khilann, I will totally make it available here on my site. And if anybody wants to know anything about what I know about the geography of the world, you have but to ask! Holy hopping Christ on a pogo stick, you guys! Look what I just found! Pre-order links for Valor of the Healer, on Amazon and on Barnes and Noble! No cover art yet or cover copy–these are very early links–but they are THERE. And if you click over to Carina’s Coming Soon page and scroll down to April, OMG. I’m there. Coming Soon: Valor of the Healer! Between this and starting to get some emails in my inbox with early rumblings of info on What’s Going to Happen Next, I’m starting to get super-excited here, people. I’ve seen round 1 of both cover art and cover copy, and as soon as I have final versions of both that I’m cleared to post, I’ll be putting up an official Valor of the Healer page similar to the one I have up for Faerie Blood! You guys. I’M GOING TO HAVE ANOTHER BOOK! With the agreement of myself, my agent, my editor, and the rest of the team at Carina Press, we now have final titles for my trilogy! As of RIGHT NOW, the book formerly known as Lament of the Dove shall be henceforth referred to as Valor of the Healer! Book 2, formerly Shadow of the Rook, becomes Vengeance of the Hunter. Book 3, formerly Lone Hawk’s Flight, will be Victory of the Hawk. And the series title over all will be Rebels of Adalonia. I’m feeling quite happy about these titles over all, especially for Book 1, since that very nicely captures the whole character arc I’m doing with Faanshi in that part of the story. And I like the alliteration of the V and H words in each title. I’ve been asked this on Google+, so I’ll go ahead and note here that the title changes were brought about for two reasons. One, because ‘Lament’ was determined to not really fit Faanshi’s character arc. This was in fact something that beta readers had brought up to me (and did I mention, YOU GUYS ARE AWESOME LIKE THAT), so when Carina raised the issue, it wasn’t surprising to me at all. Two, because ‘Dove’ was thought to be kind of questionable for the fantasy market. This, too, wasn’t really surprising. I also had a beta reader note to me that they felt that ‘Lament of the Dove’ actually sounded like a Western! And on a related note, especially given that a lot of Carina’s buying audience is coming out of the romance genre, I could also see people thinking ‘Dove’ has connotations of inspiration romance–which is definitely not what I’m writing. So! Valor of the Healer it is. I get to make appropriate changes in the copyedit pass I need to do this weekend! And y’all be on the lookout for this to get incorporated into info right here on my site as well as in upcoming announcements as they happen! Nothing concrete I can report yet–but I can tell y’all that the trilogy I’ll be releasing via Carina, starting next spring, IS being busily planned behind the scenes! I’m starting to see–and participate in!–various important things that need to be planned. We’re talking titles. We’re talking cover art. And we’re talking cover COPY. It’s starting to feel real, people, even above and beyond having an editor take my manuscript into the ring for several hard workouts! Now we have several other people involved too. People BESIDES ME are putting effort into making this book a reality, and laying the groundwork for the other two books to follow. When I have specific tidbits I can share with you all, OH SUCH TIDBITS I WILL SHARE. Stick around, folks, it’s going to get progressively more entertaining around here in the coming months! I’ve been flinging this news around under the radar for a while via offline channels, and dropping hints about it in online channels. Now, though, the time has come to make a formal announcement! 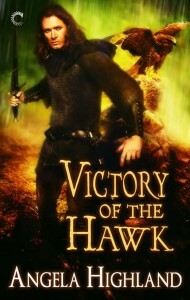 Ladies and gentlemen, my high fantasy trilogy, The Dove, the Rook, and the Hawk, will be published starting in 2013 by Carina Press! This, O Internets, was the other half of the Big Writing News I’ve had this year (the first half of which was the news that I am now represented by Miriam Kriss of the Irene Goodman Literary Agency)! I’ve been sitting on this as long as I have, to give things time to mature enough that it’s clear that we’ll be moving forward. And now that things have done, here you go! How excited am I? SERIOUSLY EXCITED. Here are various important questions about this deal, and their answers! You said something earlier this year about a pen name! Does this mean you’re using one? Yes! The Dove, the Rook, and the Hawk will be published under the name Angela Highland. The main reason for this is that while my actual name is certainly unique, it’s also difficult to spell correctly. In particular, the apostrophe, coupled with the fact that the T that comes after it is actually lowercase, has always been a problem for me and Dara. Many, many automated systems take one look at “Korra’ti” and promptly explode, mangling the name in the process. Also, even people who have known Dara and me all our adult lives have issues spelling our name. So it is the consensus of my agent, my new editors at Carina, and myself that using a more user-friendly surname will be wiser in general, when it comes to attracting new readers. With that in mind, my official writing site will continue to be accessible via angelakorrati.com, but the domain name angelahighland.com is also now live and redirects to angelakorrati.com as well. I have development plans in progress for a new site, and when that goes live, I’ll be flipping the domains around and making angelahighland.com the canonical one. Where did you get the name Highland from? It’s my original surname! It seemed a fairly safe and obvious choice, especially given that I have yet to find a single active author using that as a name. When will the first book be out? Book 1 of the trilogy is currently slated for release in April 2013, with Books 2 and 3 to be scheduled as I can deliver them. While its current working title remains Lament of the Dove, you should all expect a different final title. One of the issues that got brought up by my beta readers surfaced again when Carina made me the formal offer, which is to say, the term ‘Lament’ no longer really fits Faanshi’s character arc. So we’ll be swapping that out for a better word. More on this as events warrant. If you’re going to be published via Carina, does this mean you will be in digital form only? Yes, for the time being. Carina is primarily a digital imprint, though a few of their best-selling titles have been released in paperback. Note however that those titles to date have been romance titles. To the best of my knowledge, whether or not my trilogy hits print will depend upon how well it sells. So if you have a vested interest in seeing Faanshi, Julian, and Kestar in print as well as electronic format, this is me asking you in advance to be prepared to encourage everybody within range to buy the books! Did you say romance? Wait, why did you sell a fantasy trilogy to a romance publisher? Because Carina actually publishes all genres. Their fantasy selection is so far pretty small, but I’m very eager to add to that list, and I encourage all of you to consider giving all of their fantasy and science fiction titles a chance, so’s to encourage them to do more! What does this mean for the works you’re doing for your Kickstarter? As I have already apprised all of my Kickstarter backers, this will slow me down somewhat delivering Bone Walker and the two scheduled novellas to people who supported that project. However, this does not, repeat, NOT mean I am abandoning those works. I’m hoping to be able to still deliver the remaining works involved with the Kickstarter by the end of this year, and will be working on them as much as I can in between doing the edits on Lament through the rest of this summer and fall. Oh, I’m sure there will be more news to come, but for right now these are the high points! I am looking hugely and I mean HUGELY forward to having Faanshi, Kestar, and Julian take their places alongside Kendis and Christopher’s crowd, so that you all can see their stories as well! Those of you who RPed with me on AetherMUSH back in the day will certainly recall that Faanshi and Julian were my primary characters there. They have been heavily altered for this storyline, but that they’ve stayed with me all this time and demanded I give them a proper story is a testament to the strength of the environment in which they were born. Y’all may rest assured that Aether, and in particular Astra Poyser, will figure prominently in the Acknowledgements and Dedication sections of these books! And that’s it for the time being! So if anyone has questions I haven’t covered here, drop me a comment and let me know!